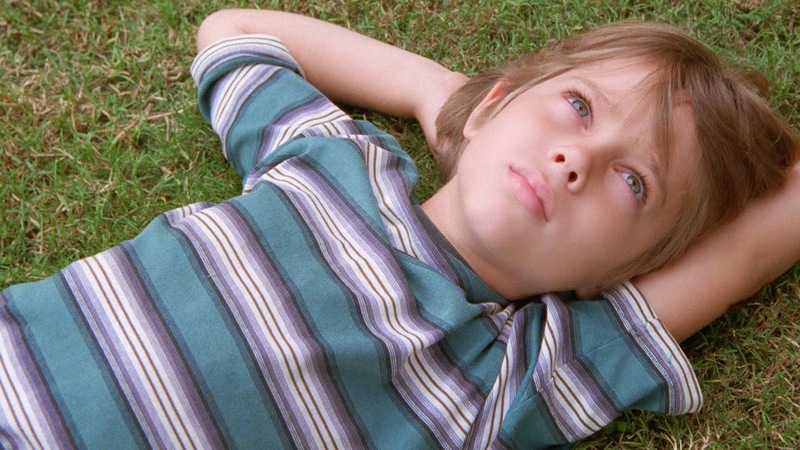 This movie, directed by Richard Linklater takes the story of a young boy on a 12 year journey of his life. What makes this movie unique is that Richard used the same characters: son, Mason played by Ellar Coltrane; mother, Olivia played by Patricia Arquette; sister, Samantha played by Lorelei Linklater; and father, Mason, Sr. played by Ethan Hawke throughout the 12 year span of the movie. Mason’s life goes through the up and down being a kid, an adolescent then a teenager onto adulthood. It starts off as Mason tries to make sense of things as he sees his divorced mother struggle as single parent trying to raise him and his sister. His mother returns to school to pursue her education to make a better life for her and her children. She believes that her kids need stability so she married her college professor but eventually finds herself in an abusive marriage. Wanting to protect her kids, she leaves the husband and all their belongings and moves in with a friend and their family. Each year, the movie touches on a particular situation that portray the developmental changes of Mason and Samantha. Olivia finished her degree and pursues her career. But as always she struggles with the changes of men in her life as well as her need for financial stability. Mason's father who is a constant present in his life also struggle with his issues. As Mason reach adulthood he must decide his fate as each person in the family chooses their own path of contentment. This movie portrays a realistic view of this family growth as it shows the changes of each character as they grow over a 12 year period. The writer did a great job keeping the same characters and allowing the audience to see the changes in life as it is during that time. It also allows the audience to reflect on their own journey from adolescence to adulthood. Richard knew this was a risk taker because anything could have happened to the characters during the 12 years of making the film. It a sense, he did a great job on this movie exploring each character and building on them as the years progressed. I highly recommend for everyone to see this movie. It's an honorable and obviously artistically successful project, my personal quibbles notwithstanding.